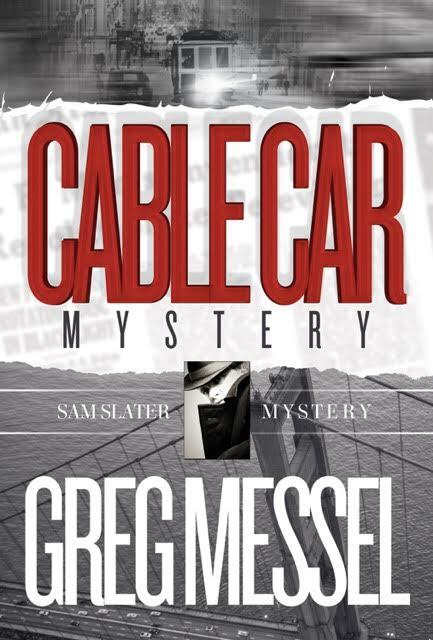 Award winning author Greg Messel spins a new tale of intrigue in Cable Car Mystery, the sixth book in the Sam Slater Mystery series set in at the 1950s in San Francisco. 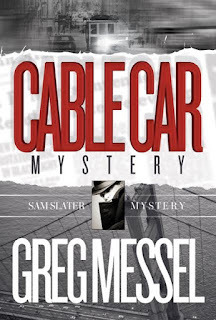 Cable Car Mystery is available at Amazon. In the coming days Amelia would try to recall the precise details of the events she witnessed in the middle of the night on Wednesday. Amelia would never be able to pinpoint exactly what woke her from a sound sleep at 2 a.m. As she rolled onto her back and listened, she heard a funny noise inside her house. Amelia looked at Sam who was undisturbed and sleeping soundly. She heard the noise again. It seemed to be coming from inside the house. A gentle banging noise, like two pieces of wood colliding. Maybe it was her recently adopted Siamese cat Aloysius, prowling around and getting into mischief. Amelia knew the tomcat roamed the house at night and slept much of the day. Sam and Amelia’s bedroom was located on the second floor of their posh townhouse on Leavenworth Street. The cat’s first choice for a night time activity was to sleep between Sam and Amelia. Sam quickly vetoed that notion and shut the door on Aloysius at night. The Siamese cat then spent his time pursuing nocturnal adventures. Amelia gently rolled out of bed and when her feet touched the cool floor, it sent a chill through her. She was wearing a short, yellow, baby doll nightie which provided little warmth when she was not under the covers with Sam. She heard the noise again. It seemed to be coming from the spare bedroom. Amelia crept down the hall and reached for the knob on the bedroom door. She hesitated. What if there was an intruder? Maybe she should go get her gun or wake up Sam. She then decided to proceed. Amelia grabbed the door knob and slowly turned it. Amelia felt a suction grabbing the door making it harder to open. She threw her shoulder into the door and popped it open. The bedroom was dark and cold. Immediately she saw the source of the noise and the cool temperatures. The trademark San Francisco wind had come up during the night and it was howling. The blinds on an open window were slapping against the window frame pushed along by the stiff breeze. Amelia hurried to the window and pulled up the blinds. The wind penetrated her skimpy nightgown and chilled her to her core. She reached up to push the window closed but stopped when she noticed Aloysius sitting calmly on the second story roof looking out at the horizon. “Aloysius, get over here,” Amelia said in a stern whisper. Aloysius turned his head briefly to give her a condescending look and then ignored her, resuming looking out on the horizon. Amelia was freezing but didn’t want to leave Aloysius out in the wind storm. Then something caught her eye beyond the cat on the roof. This was the window which offered a full view of George’s back yard and his house. The car she had seen in the driveway the last several days was running and backed up to the garage with it’s trunk open. Despite being essentially naked and buffeted by the wind, Amelia strained her eyes to see the strange figures. In the faint light from the headlights and the light in the trunk, Amelia could see the large bald man, the one she had seen looking out the window, struggling with something in the garage. Then a second man emerged from the garage. He was a husky square-looking man with closely cropped hair, who looked very formable. The two men now emerged into full view at the rear of the car. They were carrying a large, oblong object, which was wrapped in a plaid blanket. There were two ropes tied around the object. The two men slammed the trunk closed and quickly got in the car. Amelia stood at her bedroom window transfixed watching the taillights disappear into the night as they drove away. Greg has written nine novels. His latest is “Cable Car Mystery" which is the sixth in a series of mysteries set in 1959 San Francisco. “Shadows In The Fog,” ”Fog City Strangler," "San Francisco Secrets," "Deadly Plunge" are sequels to the first book in the series "Last of the Seals." His other three novels are "Sunbreaks," "Expiation" and "The Illusion of Certainty." 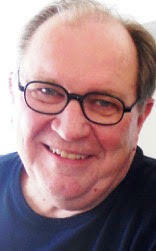 · Visit Greg Messel’s website. · Connect with Greg on Facebook and Twitter. · Find out more about Greg at Goodreads. Greg Messel is giving away an autographed copy of his book, FOG CITY STRANGLER, & an autographed copy of his book, SHADOWS IN THE FOG! This giveaway begins May 2 and ends on June 30.